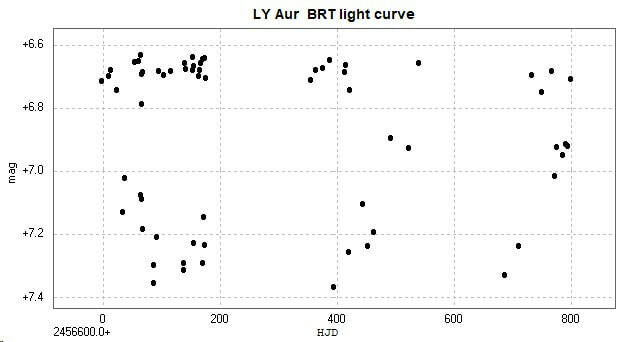 Light curve and phase diagram of the EB type eclipsing binary LY Aurigae / LY Aur. These were constructed from 64 unfiltered images taken with the Bradford Robotic Telescope Cluster Camera (BRT) between 2013 October 30 and 2016 January 10. 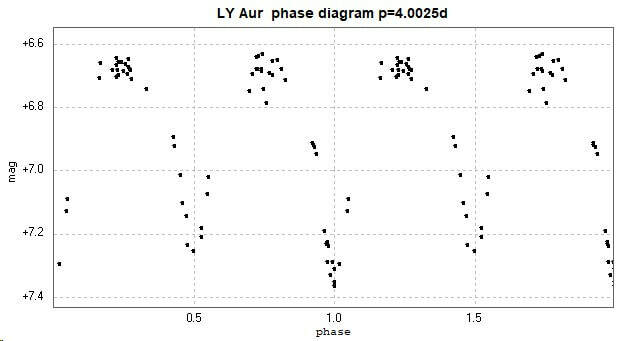 The catalogue period for this star is 4.002494d (GCVS), 4.0024932d (AAVSO VSX) and 4.0024906d (Kreiner). There is little o-c activity evident for this star (Kreiner). (Accessed 2019 January 27).